NOTE: Although the WOBE-MUGOS® formula -- which was used in every single one of these trials -- is not yet available in the United States, it is under evaluation by the Food and Drug Administration for consideration as an investigational new drug in the area of cancer theapeutics. In the meantime, our advisory board members with experience in cancer therapeutics suggest that WOBENZYM®N (which is available at health food stores and natural product supermarkets) can be profitably substituted for WOBE-MUGOS. 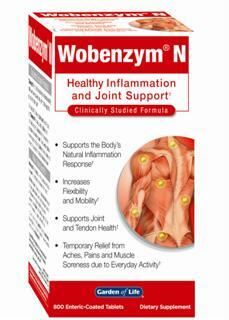 Wobenzym N has an enzyme activity of approximately 900 FIP and WOBE-MUGOS 1200 FIP. From results of the clinical trials we speculate that the important enzymes in oncology might be chymotrypsis and papain which are ingredients in both preparations. However, WOBE-MUGOS contains the highest amount of chymotrypsin and papain per tablet. Regarding the concentration of chymotrypsin activity being part of pancreatin it might be sufficient to substitute five tablets of WOBE-MUGOS taken three times daily with ten tablets of Wobenzym N taken three times daily. Of course, for cancer treatment, we advise our readers to work with their physician. Numerous studies worldwide indicate that systemic oral enzymes can often be used to great advantage as adjuvant treatment to complement cancer therapeutics. The clinical experience of leading European oncologists such as Drs. Michael Schedler and Heinrich Wrba convincingly demonstrates the utility of such preparations in a wide range of cancers (see The Doctor's Prescription for Healthy Living, volumes 4.3 and 4.4: 10-11, 18 and 14-15, 20, respectively). What's more, the National Cancer Institute is now funding a multi-million dollar study on the use of systemic oral enzymes in treatment of pancreatic cancer (see also volume 4.3: 10-11, 18). Systemic oral enzymes not only benefit overall immunity, they help to reduce the side effects and complications of chemotherapy and radiation, thus enabling optimum dosages with minimal adverse consequences and improved therapeutic outcomes. For about 30 years, a number of work groups have concerned themselves with the influence of proteolytic enzymes on metastasis. In the 1960s, scientists were of the opinion that cancer cell stickiness resulting from a deficiency in enzymes was responsible for the frequent development of secondary tumors. This stickiness of the cancer cells was generally recognized to result from the excessive formation of fibrin. The close relationship between fibrin deposits and other types of invasive tissue growth and metastasis is adequately described in international literature and is generally accepted. The discovery of substances, known as adhesion molecules, provided important new impulses for current scientific discussions. Inflammation also plays a role in cancer spread. Since the endothelium of tissue with inflammatory alterations has a thicker layer of specific adhesion molecules, these are sites where metastasis are more likely to occur. The importance of chronic progress of inflammation in tumor growth and metastasis has been demonstrated in studies which verify the influence of anti-inflammatory therapy on inhibiting metastasis. Formation of fibrin on the tumor cell membrane supports this adhesive process and serves as a protective barrier against tumor cell recognition by the immunological system. Proteolytic enzymes inhibit both excess fibrin deposition and inflammation, thus helping to prevent the spread of tumor cells. Indeed, one of the most impressive features of clinical trials for patients with multiple myeloma, breast, stomach, colon and pancreatic cancers, is prolongation of survival time. This may reflect reduced tendency toward cancer spread. We've combed through many of Europe's leading medical journals in order to provide results for some cancers for which systemic oral enzymes work best. Most recently, Dr. Wrba's team has looked at how systemic oral enzymes help in difficult-to-treat cancers such as multiple myeloma and they are currently preparing an important paper on prolonging survival among patients with this usually fatal disease. In fact, the U.S. Food and Drug Administration has approved investigational new drug status for use of a systemic oral enzyme preparation (i.e., Wobe-Mugos® from Mucos Pharma GmbH) in treatment of this cancer. It was found that treatment with Wobe-Mugos® in addition to conventional chemotherapy prolongs remission times in stage II multiple myeloma patients and reduces the concentrations of progression markers. In a large-scale study performed on 5,400 patients with stomach cancer, Dr. J.P. Kim was able to attain an increase in the five-year survival rate in more than 50 percent of patients through the administration of systemic oral enzymes with picibanil (OK-432), an immunomodulatory extract derived from Streptococcus pyogenes. The enzyme had both an immunoregulatory effect and inhibited metastasis. The study impressively demonstrated the highly improved immune status in patients treated with the WOBE-MUGOS preparation. The therapy with picibanil and systemic oral enzymes also improved natural killer cells' ability to destroy cancer cells. In another prospective, randomized, placebo-controlled clinical study, patients receiving adjuvant therapy with systemic oral enzymes experienced half the rate of death and recurrency. Dr. A. Sakalova observed the positive efffects of systemic oral enzyme therapy in the treatment of patients with solid and metastatic colon cancer. In an open clinical study, 23 patients who had undergone surgery were subsequently treated with chemotherapy and systemic oral enzymes. During the observation period of six to thirty months, 64 percent of the patients were still alive. Dr. W.D. Blessing also reported on the success of a complementary therapy with systemic oral enzymes in treatment of colon cancer. The patients generally survived longer than two years after the start of the initial therapy when treated with complementary WOBE-MUGOS therapy. A number of these patients have already survived for five to twelve years. Drs. Hager and Abel developed a complementary therapeutic concept to patients with advanced pancreas carcinoma and treated 30 patients. After beginning the therapy, 17 patients were completely free of pain within a short time. All of the other patients claimed to have experienced a substantial to very substantial reduction in the amount of pain. The general state of health of the patients improved as well. A clear prolongation in life expectancy was attained with more than half of the patients enjoying a prolongation of survival of one to two years or longer. Dr. G. Stojanow treated 83 patients with gynecological tumors (cancers of the cervix, breast, uterus) using a complementary therapy with systemic oral enzyme therapy. An improved response to the primary therapy was observed, as well as an improved quality of life and reduced periods of hospitalization. The observation that systemic oral enzyme therapy clearly inhibits development of metastasis is especially interesting. Dr. A. Hofmann also reported on successfu use of systemic enzyme therapy for treatment of inoperable uterine cancer. Dr. O. Rokitansky and co-investigators performed multiple retrospective and randomized studies on the complementary application of systemic oral enzymes in the treatment of breast cancer. Comparing the results of the retrospectively evaluated findings, the patients receiving complemetary therapy had higher survival rates free of recurrency. Systemic oral enzymes seem to help most in ovarian cancer by addressing the dose-limiting factors involved in chemotherapy, such as liver toxicity. In one clinical trial, chemotherapy was followed by five days of intensive systemic oral enzyme therapy among 59 patients who were treated with chemotherapy following surgical intervention. Among women receiving the enzyme therapy, average thrombocyte and lymphocyte count became normalized. During recent years, various therapists have reported cases of patients with T cell lymphomas who have undergone therapy using systemic oral enzymes which has resulted in a regression of the tumors that has lasted for up to 10 years. Raul Ahumada, M.D., documented one case in which the state of health of a 51-year-old man with a typical clinical picture of a T cell lymphoma in an advanced tumor stage had deteriorated rapidly. The skin biopsy revealed a lymphatic tumor (T cell lymphoma of the skin). However, after six months of therapy with systemic oral enzymes, the patient's symptoms had improved substantially. No cancerous cells, subcutaneous nodes or tumor remnants could be found. The patient's state of health had remained stable for the last five years. Down regulation of metastatically relevant adhesion molecules. Increase in the immunogenicity (mucin, fibrin, inhibitory substances) of the tumor cells. Down regulation of metastatically relevant adhesion molecules on the endothelium. Numerous clinical reports and publications demonstrate a positive influence of systemic oral enzymes on the prophylaxis of metastasis and on the prevention of recurrency. For all of our reports on systemic oral enzymes and cancer, visit www.freedompressonline.com.